and one of the most famous ones in the world, Walt Knoch's "Walt's Puffer" Fiat. The Knoch's built the first Fiat in 1959, and it was the first A/A to hit 150 MPH, a world record, on Thanksgiving Day, 1959. The AMT Model car company came out with the Double Dragster kit that contained a miniature of the Walt's Puffer complete down to decals and numbers, A/A285. The Fiat received a chopped top in 1961, and continued to set NHRA National records on almost every run. Many cars and stories followed and you can read a more detailed account at the official Walts Puffer website at www.nitroalley.net. 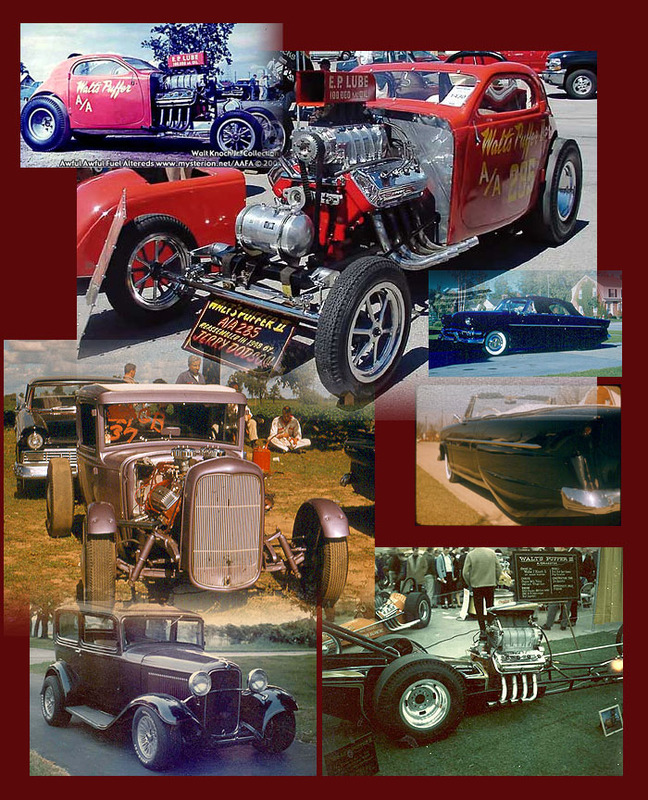 Walt was kind enough to send some other photos for the HRD site and you can see them below including a real cool 54 custom, wicked Model A Coupe with six deuces, very nice 32 sedan, and the Puffer III rail.